The J.D./M.L.S. and J.D./M.L.S. programs allow students who are interested in a career in law librarianship to simultaneously pursue a Juris Doctor degree and a Master of Library Science or Master in Information Science degree. These joint degree options are available to both Day and Evening Program law students. The programs require 24 semester hours of required and elective courses in the M.L.S/M.I.S. program and 88 semester hours of required and elective courses in the J.D. program. The program is structured to allow students to earn both degrees in less time than is required to earn each degree separately. Students interested in either of these programs must apply to both schools separately. For further information, contact Professor Patrick Roughen of the School of Library and Information Sciences by e-mail proughen@nccu.edu or phone 919.530.5151 or Professor Nichelle Perry, Law Library Director by e-mail nperry@nccu.edu or phone 919 530-5188. 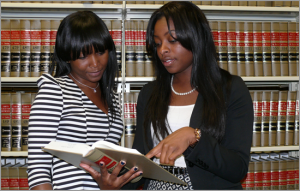 The program is designed for students who wish to enter the field of law librarianship. Admission to both the School of Law and the School of Library and Information Science are required. Students must apply to both schools separately and meet the standards and requirements set by each program. (LSAT score may be used in lieu of GRE for admittance to School of Library and Information Science) Students already enrolled in the Law School may apply for admission to the program no later than the end of their first year of law study (30 credit hours), and students already enrolled in the School of Library and Information Science may apply to the Law School no later than the end of their first year of MLS study (18 credit hours). JD/MLS – 103 combined credit hours. Twenty-four, required and elective, from the MLS program and 88, required and elective credit hours in the JD program. Nine credit hours of library science courses will meet the elective requirement for the law degree (79 law, 24 library science) While enrolled in the program, students must satisfy the academic requirements of each school as an incoming class. *Student may take other electives with approval from advisor. The program is designed to allow students to develop a deep technological understanding of the legal issues in the Information and Computer Technology industry and to learn about technology requirements in a law practice. JD/MIS – 103 combined credit hours. Twenty-four, required and elective, from the MIS program and 88, required and elective credit hours in the JD program. Nine credit hours of library science courses will meet the elective requirement for the law degree. (79 law, 24 library science) While enrolled in the program, students must satisfy the academic requirements of each program.